Our definition of a diva is someone who strives to 'hit the high notes', who perfects their art, or indeed their craft, not giving up until they’ve nailed it. At Barndiva’s opening 14 years ago our divas baked bread (Lou Preston), made exquisite vinegar (Karen Bates), award winning chocolate (John Scharffenberger and Michael Recchiuti) and handcrafted charcuterie (Paul Bertoli, pre-fra’ mani). It is hard to imagine, five decades ago, what Merry Edwards faced as a woman trying to gain entrance into the ego driven, wholly male dominated wine industry. Yet against great odds and challenges anyone but Merry would have called setbacks, she has lived a life filled with high notes, balancing soil and weather as if analogous to life and craft. In the course of her remarkable journey she steered an entire industry away from the dangers of lead capsules, and did pioneering work with clones that unarguably changed the history of California wine making. She won a James Beard award and was inducted into the Culinary Institute’s Vintners Hall of Fame. From early acclaim producing Pinot Noir for Mount Eden and Sauvignon Blancs for Matanzas Creek, hers is a passion for choosing small sites where the right rootstock, clone and farming techniques might produce exceptional grapes. It’s a lifelong curiosity about soil that extends to farming, food and flowers. Merry didn’t do it alone, of course. And she is the first to acknowledge the importance of having great teachers who have your back. In her career this included Dr. Maynard Amerine, Dr. Harold Olmo, and Joe Swan; she and husband Ken Coopersmith have worked as a team for two decades making exceptional estate wines at Meredith and Coopersmith Vineyards, and most recently from their new home and vineyards in Sebastopol, planted with Merry’s Clone, UCD 37. The two other woman winemakers in our spring SommTable Spotlight Series, though still early in their careers, share in their own way the diva drive and focus. Both work within strong namesake and family partnerships - Chantal Forthun with Walt and Joan Flowers, Vanessa Wong with Nick and Andy Peay. Both have something else in common - making wine with fruit grown in one of the most thrilling but risky regions of the world - the "Extreme Sonoma Coast." 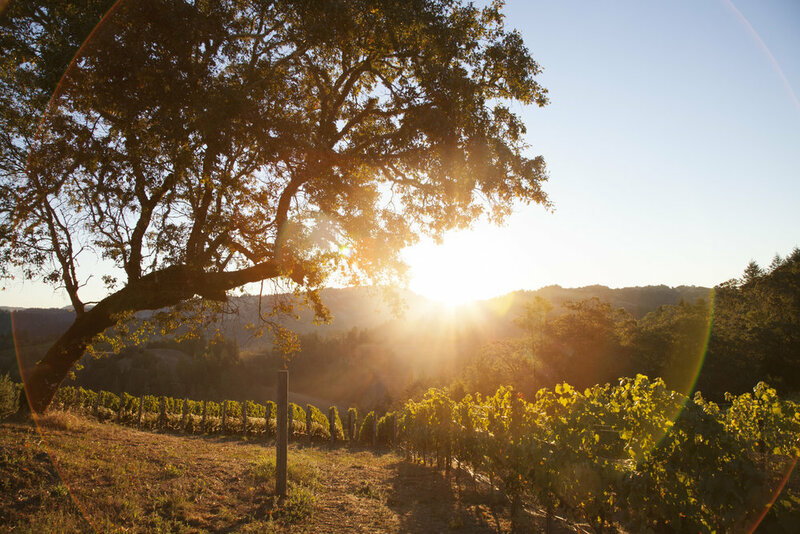 When Walt and Joan Flowers purchased 321 acres of ridge top land only 2 miles from the Pacific in 1991 and planted grapes, they were the definition of outliers. Their belief was that the dramatic variables in weather in this rugged coastline, if farmed the right way, could be harnessed to produce uniquely remarkable cool climate varietals. If the idea seemed crazy at the time, they soon put paid to naysayers. Chantal arrived in 2012, two years into the Flowers' adoption of organic farming practices and native fermentation for 100% of their winemaking. Born and raised in the Central Valley, she had studied botany at Chico State and become an enologist before moving, fortuitously as it turned out, to Bonny Doon in 2008. A mentorship with Randall Grahm impressed upon her the importance of biodynamic farming, winemaking using native yeast, the practice of gravity flow. It was working as an associate winemaker with Randall that Chantal adopted his mantra, which she defines as "a dedication to transparency in an industry filled with smoke and mirrors." In 2011 she returned to the Santa Cruz mountains to make wine for acclaimed Pinot producer Rhys Vineyards, which brought two great loves into her life: the man who would become her husband, and small batch Pinot Noirs made in the Burgundian style. Chantal produces Chardonnay and Pinot Noir from the two organic, bio-dynamically farmed Flowers estates - Camp Meeting Ridge Vineyard and Sea View Ridge Vineyard. Great care is given to every stage of winemaking, starting with hand harvesting grapes in the early morning. Pinot grapes have long cold soaks before wild yeast fermentation, the better to showcase the terroir; they are left in contact with the skins, which brings out resplendent color and flavor. Chardonnay grapes go directly to the press and are allowed to settle before going into French Oak barrels for 100% barrel fermentation. Every step Chantal takes strives to enhance the breezy, foggy and intermittently hot coastal climate. Both Chantal and Vanessa, though distinctly different winemakers, capitalize on the cool weather of their unique locations for a slower ripening season, which allows for delicate aromatics in the skin. Both young women, dedicated to sustainable farming practices, craft earth-driven wines of elegance and complexity. But more to the heart of what motivates our wonderful Spring Spotlight Series of remarkable women, as Merry Edwards discovered many years ago facing manmade boundaries she longed to cross, when you know what you love and work very hard to become good at it, no borders can stop you from the promised land. We are honored to have all three of these powerhouse women winemakers join us at The Somm’s Table this Spring and early Summer. Merry Edwards on Friday, March 2; Chantal Forthun on May 25; Vanessa Wong with Nick and Andy Peay on June 15. Ryan cannot wait to cook for them, and Alexis will join us to host. The stories continue, the wine will flow.